It's another Hippie Peace Pup! 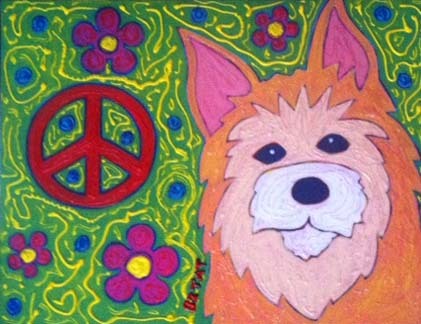 Keeping with my theme of “Hippie Peace Pets” I painted another Peace Pup. I went a little crazy with textures on this one, using Scribbles fabric paint to put squiggly lines on it. it is hard to capture in a photograph, but there is glitter on it as well. I hope you like it! I am posting the painting above for auction. The auction is short lived, so get your bids in fast and watch closely! Highest bid at 10 pm ET Wednesday, February 27, 2013 wins the piece. 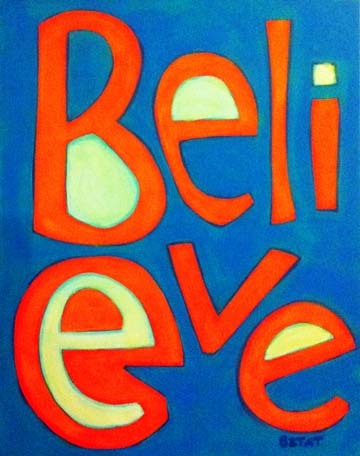 Believe – in yourself and what lies ahead. A number of challenges have come my way of late. Some of these challenges have the appearance of unsolvable problems. Are they brilliant disguises or truths revealed? I have been around long enough to know that no problem can slay me in my quest for purpose and impact in my life. But there are many problems that can make my journey less than comfortable. Those are the sort that are encumbering me now. I won’t go into detail. I have no need for sympathy or pity. I am just stating fact. We all go through it. The challenge in being human is allowing oneself to believe that, regardless of being a disguise or a truth, all life experience takes us to a place where there is opportunity – and choices to make. I am lucky that opportunity awaits me without disguise, and I am thankful for those who support and care no matter what my challenge is. I look forward to my travels ahead. That is what faith and belief are to me. Highest bid at 10 pm ET Tuesday, February 26, 2013 wins the piece. My hippie Peace Pets, inspired by a totally random Facebook conversation, have been a surprise winter hit for 2013! I guess we all needed something to pull is out of the winter doldrums. 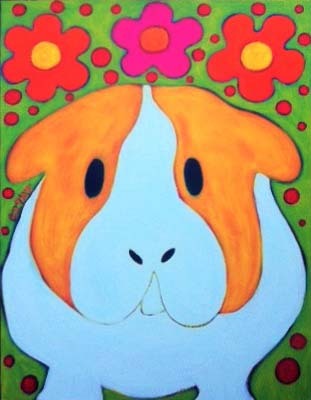 The biggest surprise to me was the popularity of my Guinea Pig painting of the other day. People liked it so much, I decided to do another piggy painting. Highest bid at 10 pm ET Saturday, February 23, 2013 wins the piece.